The Titan T-3 Series Heavy Duty Power Rack is perfect for any professional or at home gym. Built using heavy 11ga (3.25mm) steel, this rack will not give way or back down. 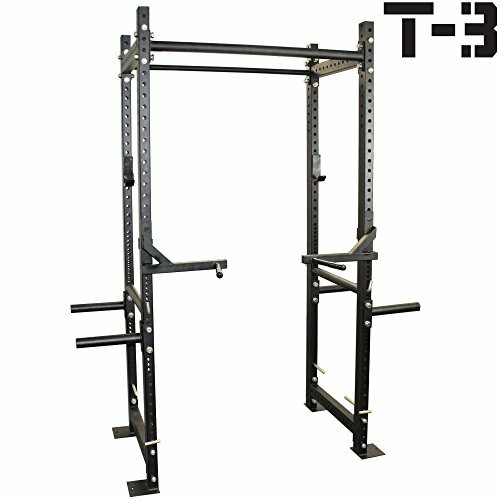 T-3 Power Racks use 2"x3" steel tubes. You will notice right away how every piece is heavy and solid. It's perfect for dips, bench press, curls, pull ups, and much much more. The pre-drilled holes follow the "West Side" hold pattern allowing you to move the bar up or down in just 1" increments when using a bench. The weight tree attachments and J-hooks are included and are easily installed. The 5/8" hardware provides maximum security even when the rack is completely maxed out. The bolt-together construction allows you to easily transport and fit the rack in to any room or basement! - First pull-up bar: 1 1/4"
- Second pull-up bar: 2"